Under Fire: Soviet Women Combat Veterans, WWII is a groundbreaking account of women in combat. Decorated Soviet women describe their years of fighting the Nazis amid blood, lice and death and emerging victorious. Almost a million women and girls fought in this war, the largest such mobilization in history. Under Fire captures the he- roics of this great generation of women, focusing on why they enlisted, what they did, what combat was really like, how it felt to fight among men, what gave them strength and laughter, and how they reflect upon those years and their lost youth. 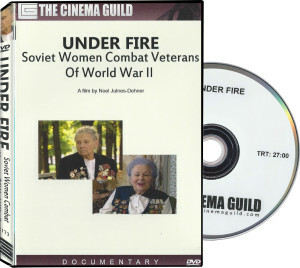 Under Fire was shown on U.S. and Ukrainian television, in U.S. and Ukrainian film festivals, and in museums and libraries. It was featured at The Kennan Institute of the Wilson Center in Washington, D.C. It is available through Cinema Guild. With colleague Dr. Joan Lindy, their traveling photojournal display of the same name was funded by the Ohio Humanities Council and featured in the National Endowment for the Humanities’ journal as one of the nation’s most interesting projects. At that time, the stories of women in combat—and especially from the eastern front—were rarely told, and their inner worlds unexplored.